I am born in a Christian family in Orissa State, India. My village and community being reached by some Canadian Baptist missionaries at least 70 years before were saved and trained to look after the church. They have established almost more than 40 church through out my district each village a church. I would be the fourth Christian generation to my community. My great grand father was the first pastor of my local/ mother Church. My parents were godly and active in church. Well, being born in Christian family I did not know that I am not a Christian till I become 20 years old. Once it happened I had stolen Rs.100/- ($ 2.5) from my father’s pocket and had spent more than half of it. The day passed by, but till we sit for the evening family prayers I did not know that my father already knew I had stolen. Usually he often tells me or my sister to read a chapter from the Bible. But that day my father himself read from the Bible a chapter, Proverbs 4. He read so calmly, systematically and clearly that every words of that chapter touched my heart. And I know in me some ting going to happen. Then my father asked me whether I have stolen the money or not. I was just silent and scared. The words of the chapter were still pricking my heart and pointing my sinful life. Then my father said me that he is going to pray whether I confess and accept my mistake or not. But he was waiting for my Yes or No. I could not hold any more I cried for my sinful life, fallen on my parent’s feet and asked pardon from them. As My father then prayed for me and I could realize and understand that I am a new person. And I prayed inside me and accept Jesus as my Lord and Savior. It was 16th September 1993 evening around 8 pm I became child of God. Even after the born again experience still I was very much weak and fallen into many temptation and sins. It was then my father realize that I as young man should make my way clean but how (Ps. 119: 9 – 10). He directed me to go and learn Bible and be trained for the God’s service. I joined in Eastern Theological Collage & Seminary, Noida, India and completed my B. Th. in the year 1998 and was serving the Lord in the till 1999. Beside my B. Th. studies I could gain many diverse ministerial experiences such as pioneering evangelism and church planting in several parts of the North India. It was after my 4 years of study and ministry I return home back. As I prayed for the future ahead of me God directed me for further study in Asia Evangelical College & Seminary, Bangalore, India. In 2000 I completed my M.Div and serve there as dean of the students and assistance professor for a year about. God began to use me for bigger task and achievement. I came to realize God has gifted me with teaching and preaching talents. I was blessed in serving the Lord as dean of Academic Studies in Asia School of Evangelism & Theology, Bangalore for about 4 years. After that I happened to marry Siwi, who was my classmate in M. Div studies and was serving the Lord as missionary and teacher in Nepal for 4 years. In 2005 we got married and settled in Bangalore. 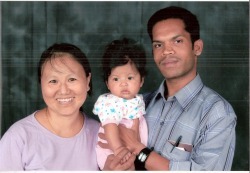 We as family joined with International Ministries Fellowship – India, Bangalore as missionaries to International Students and serve the Lord among the students from the various countries there for a year. My wife loves children and to serve among them. We then joined a Children’s Home run by New Hope Ministries, Bangalore, for a year. God blessed us with a daughter, Rachel, in 2006. As a family we struggled and had to face a lot of challenge. My daughter was just few months old, and had no house to stay for months together. Then God helped us to take a house on rental base. I had to face a lot challenges financially to care my family. I then decided to work in secular fields and do ministry beside. As answer to our prayer God gave job to work at night in Maple Suites Service Apartment, Bangalore as Front Office since 2007. Meanwhile, God graciously given an opportunity to serve a local new born church, Maranatha Fellowship, Bangalore of my friend, Pastor Venu Gopal as an assistance pastor. Meanwhile God enabled me to develop my own ministry TARGET FOUNDATION, a Mission to reach Orissa with the gospel of Jesus Christ and transform the lives of my won locality, Orissa State. God has been faithfully using me and my family to win many souls of Orissa. I need your prayer supports and partnership in this vision and mission of mine for God’s glory.